With almost 50 % of its energy coming from renewable sources, Quebec is particularly well-positionned to become the first modern economy to abandon oil and to achieve energy independence. This collective project, both realist and exciting, could transform Quebec into a leading model for the rest of the planet, through a deep revision of urban planning, public transportation, but also massive adoption of hydrid car, geothermal heating and large scale wind energy production. 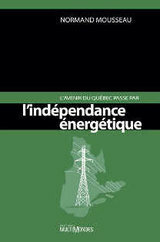 Energy independence: For the future of Québec (L’avenir du Québec passe par l’indépendance énergétique) was published in French in 2009 by Éditions MultiMondes. The book can be ordered, in paper or electronic format here: Éditions MultiMondes. The energy independence was named book of the week at the French CBC radio show Les Années lumère on May 3rd 2009.